Hmm, could she possibly be referring to the nebulous spooks that go bump in the night, or perhaps a bubbly evening beverage to taste? Both sound intriguing, but I'm actually referring to my one of a kind EHAG Emporium piece that I am offering this evening. "Spirited Sparky" was born out of my new fascination for painting ghostly figures this month. Sparky himself is a robust, black and cream colored cat, but his bulbous base tells a haunting tale of flowing ghosts in graphic shapes and hues. If you would like to adopt this original folk art character, please Email Me to secure this piece! Keep scrolling down for additional photos and details, and don't forget to visit EHAG's Emporium to marvel at the other haunting originals by fellow artists, this evening! 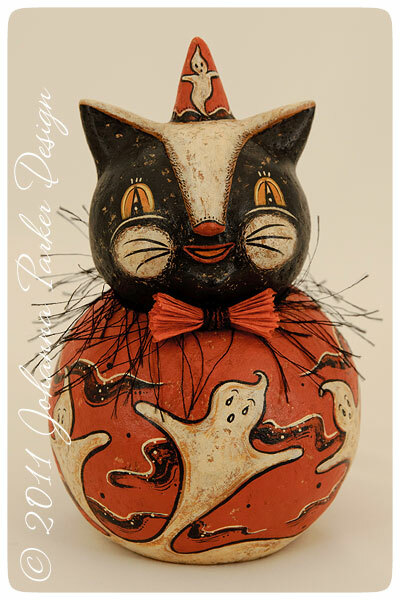 SOLD to Elaine ~ "Spirited Sparky"
He wears a wispy strand of black filament around his neck, and a handmade vintage crepe paper bow tie adds a festive touch below his chin! Sparky and his eye-catching base are intriguing from all angles. Add him tonight to your collection of haunting delights!